Voyage to the Bottom of the Sea--page 5. 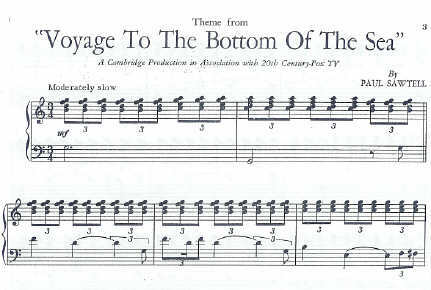 The sheet music of Paul Sawtell's "Voyage" theme was released in 1964 through Miller Music Corporation. 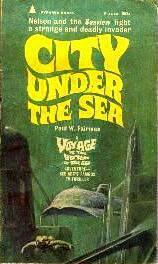 Shown left, the cover to the first release of Theodore Sturgeon's adaptation of the Voyage movie's screenplay. 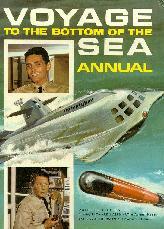 One can only figure that the artwork was done prior to the development of Seaview's final design, or someone was drunk when they did the work. 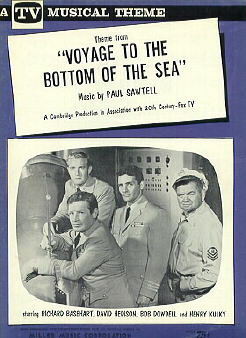 At right is the cover to the 1965 release of a Voyage to the Bottom of the Sea TV tie-in that had no relationship to Season one's episode "City Beneath the Sea. At left, I have wanted one of these European annuals for years, and recently acquired it, thanks to Ebay. The quality of writing of the story vignettes is pretty miserable, but the republished artwork from the Western Publishing comic book series looks better than in the American versions. 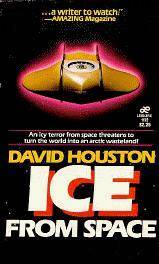 When I first encountered "Ice From Space" in a used book store, I assumed it was a Voyage novel. Not so. 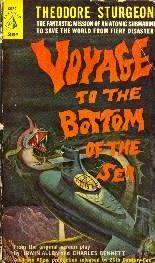 The Flying Sub's appearance on the cover of David Houston's adaptation of a "Tales of Tomorrow" screenplay (very good, by the way), has nothing to do with either Voyage or the novel it adorns.